This is a great story. So often our kids come to the library looking for books about war. I am never sure quite what they want and neither are they. This book does not cover up the tragedies of a war, but doesn't focus on those. Instead this book focuseds on this one aspect of recovery and we get to know the real dangers, the real people and the animals who were involved. And Kelly Milner Halls definitely knows how to write for kids. Here is a wonderful example of all that nonfiction can be: informative, entertaining, enlightening. 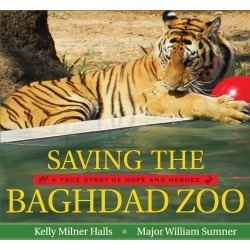 Saving the Baghdad Zoo tells the poignant stories of these remarkable animals. Meet the abandoned lions who roamed an empty palace with no food or drink; the camel, Lumpy, who survived transport through sniper fire; the tigers, Riley and Hope, who traveled 7,000 miles from home; and many more. Appropriate to animal lovers grades four and up. This book is absolutely a must-have, no-discussion, gimme-gimme purchase for the school library....This team worked hard, improvised, begged, and above all, went far beyond the call of duty to feed and care for these creatures. It's a fascinating story, a terrific discussion starter, an inspiration. It is an eye-opening and heart-breaking documentary of the post war collateral damage to the Baghdad Zoo....Together with Major William Sumner, Kelly Milner Halls had compiled various facts and anecdotes along with both heart-breaking and heart-warming photographs that carry us through the process of restoration. The re-opening of the Baghdad Zoo has become the oasis of hope to the people of Baghdad and around the globe. 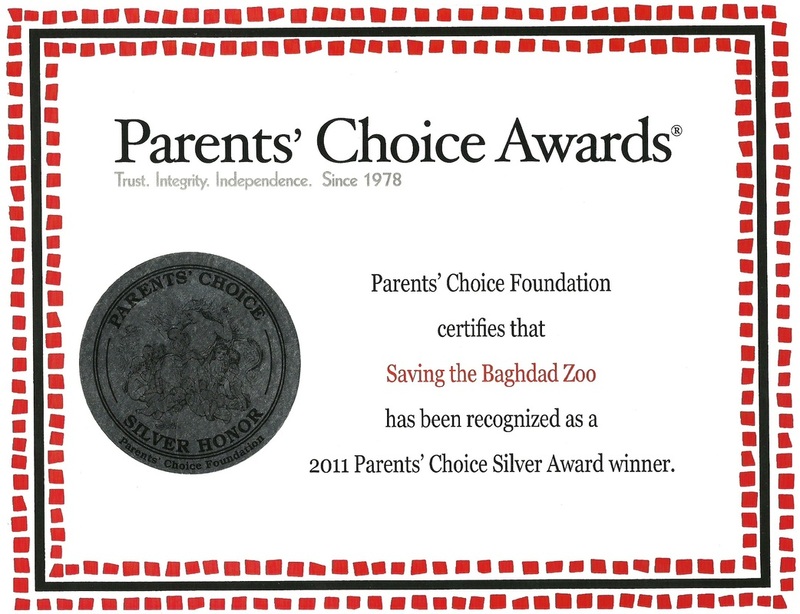 2010 Parent's Choice Silver Award Honor Book -- read more about it HERE.